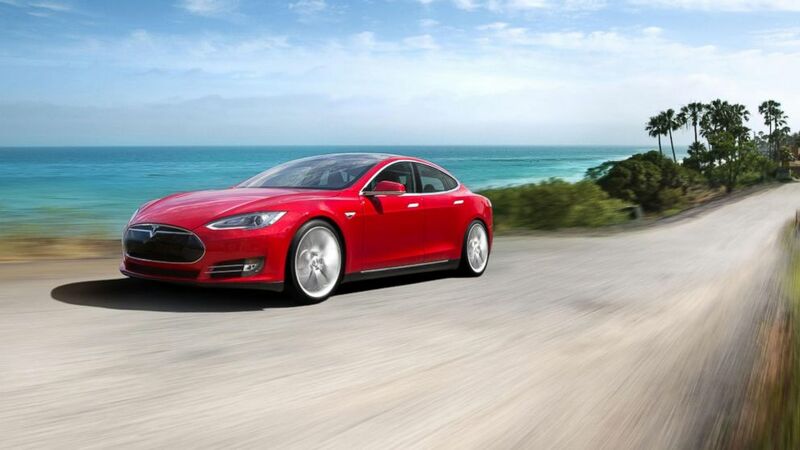 The Feds close their investigation of Tesla's Model S, after it gets an upgrade. camera (Tesla Motors ) Pictured is a Tesla Model S.
Elon Musk's Tesla Motors has adding a triple underbody shield to the company's cars after well-publicized fire incidents last year, in turn closing out a federal probe. The car undersides now have a triple bullet-proof titanium shield. Musk, chief executive of Tesla Motors, announced in a blog post that his electric car company has added a titanium underbody shield and aluminum deflector plates to Model S cars manufactured as of March 6. Existing car owners can have their cars retrofitted for free on request or as part of normal service, he said. "It is important to note that there have been no fire injuries (or serious, permanent injuries of any kind) in a Tesla at all," Musk writes, arguing again for the safety record of the Model S. "The odds of fire in a Model S, at roughly 1 in 8,000 vehicles, are five times lower than those of an average gasoline car and, when a fire does occur, the actual combustion potential is comparatively small." Musk makes no mention of the National Highway Traffic Safety Administration's investigation of the two collisions in the U.S. last year that resulted in fires. But the changes were enough for the government agency to move on from one of his many companies. Tesla has been one of the hottest companies in the world, and its shares have soared, valuing the company at $26 billion, half that of General Motors, which made 2.8 million vehicles last year compared with Tesla's less than 20,000. Musk shared three gifs of the Model S running over three ball tow hitch, concrete block and an alternator. "Nonetheless, we felt it was important to bring this risk down to virtually zero to give Model S owners complete peace of mind," Musk wrote. Musk said during 152 tests, the shields "prevented any damage that could cause a fire or penetrate the existing quarter inch of ballistic grade aluminum armor plate that already protects the battery pack." Karl Brauer, senior analyst at Kelley Blue Book, said the additional shields are a "far less" aggressive and less expensive fix than other scenarios, such as a complete re-design of the battery pack. Brauer said titanium, which is touted for its strength and light weight, is still relatively rare in cars because it's expensive. The changes to the Model S may be expensive, but not so if you consider the relative cost of the car. "People are buying the biggest batteries and best options. Most Tesla drivers have no problem checking everything on the list, which makes them $100,000 cars," he said. Ben Kallo, senior research analyst with Robert W. Baird & Co., said the changes to the Model S will have little impact on the car's weight and range, while he believes the cars will be safer. Kallo said the close of the NHTSA's investigation and the changes to the car may increase demand. "I’m sure there were people on the fence on buying the vehicle," Kallo said. If Tesla's cars are safer than gasoline-powered vehicles, this development helps at least people who are pausing." Kallo estimates the retrofitting will cost in the millions of dollars while cars will likely be retrofitted with a turnaround of a couple days. Details of the cost of the retrofitting or how long existing drivers will wait for their upgraded cars were not released.